A virtual private network (VPN) work by masking your IP address and changing the country from which you appear to the outside world to be connecting to the Internet. Netflix has recently begun to make it difficult for VPNs to be used to work around its region controls and not all VPN services will work with Netflix. So if that’s your main reason for using a VPN, check that the service you subscribe to supports it. VPNs are also used by companies to allow employees to log into a company network securely from anywhere in the world. The VPN client we’re using here, Shimo, available in Setapp, supports lots of different VPN services, including those used by commercial organizations, like Cisco AnyConnect. 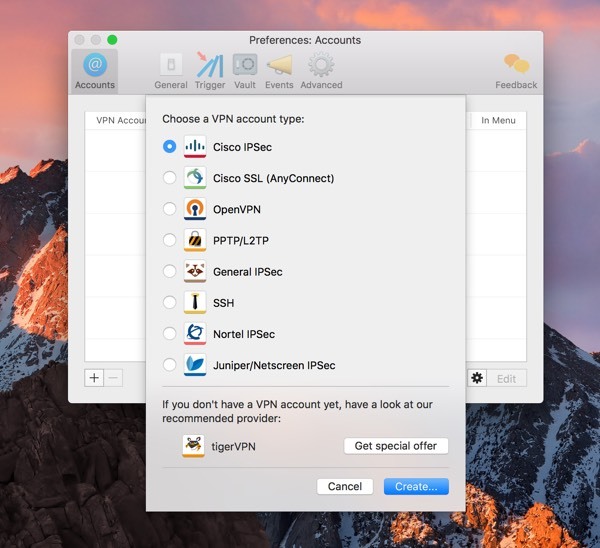 How to connect to a VPN on a Mac? We’re going to show you how to create and outgoing VPN connection with Shimo. How to connect to the VPN: if you don’t already subscribe to a VPN service, you’ll need to choose one and subscribe before you can set it up any VPN client. Some VPN service provider, like CyberGhost, offer free services, but these have few features and usually make you wait to connect limit the amount of time you can remain connected. Shimo VPN client has a special offer with a tigerVPN service provider, but it’s also worth checking out NordVPN, ExpressVPN, and Private Internet Access. If you’re connecting to a company or university network and already have the server and login details, you can skip this step. Launch Setapp and search for Shimo. Click Install. You’ll be asked to install a helper tool, so click the Install Helper Tool button. When Shimo has installed and launched, click its menu bar icon and choose ‘Add VPN account’ then click the ‘+’ button at the bottom of the window. If you want to take advantage of the tigerVPN offer, click Get Special Offer at the bottom of the window. Or, if you’re connecting to a company or university network, type the corresponding address into the box (speak to your IT support department if you don’t know the details). Type in your username and password details in the relevant boxes. If you’ve subscribed to a different VPN service, they will normally allow you to download configuration settings that you can then import into Shimo. Check the support section of the VPN service you subscribed to for information on how to do this. Alternatively, check the support section of Shimo’s website for instructions for your provider. Once you’ve downloaded the configuration file, click the Shimo icon in the menu bar and click ‘Add VPN account’ (If you can’t see that option, click Preferences and then click on the Account tab). Click on the cog at the bottom of the window an click Import. Navigate to the folder of settings you downloaded and choose the file whose name contains a town or city closest to your current location. Click the toggle switch and when asked, type in the username and password supplied by your VPN provider. Wait a few seconds and you’ll be connected. 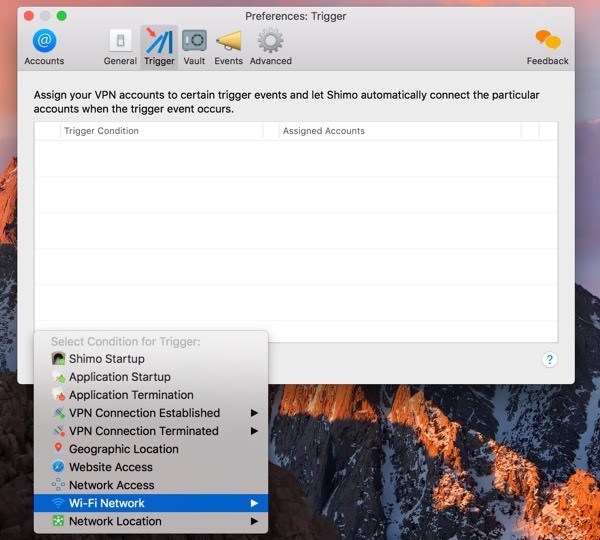 Shimo supports trigger, which allows your Mac to connect to a VPN automatically, based on an event you specify. Open Shimo’s Preferences and click Trigger. Click the ‘+ button, select ‘Wifi Network’ and choose the name of your home network. Click Save. Now click the ‘+’ next to the name of the network in the main window and select the VPN server you want to connect to. Now, every time you connect to your home wifi, Shimo will automatically connect you to that VPN. You can also set triggers for when a specific application starts up, when you’re in a specific geographic location or when you visit a specific website. Just choose the relevant trigger condition and then the VPN server you want to connect to. 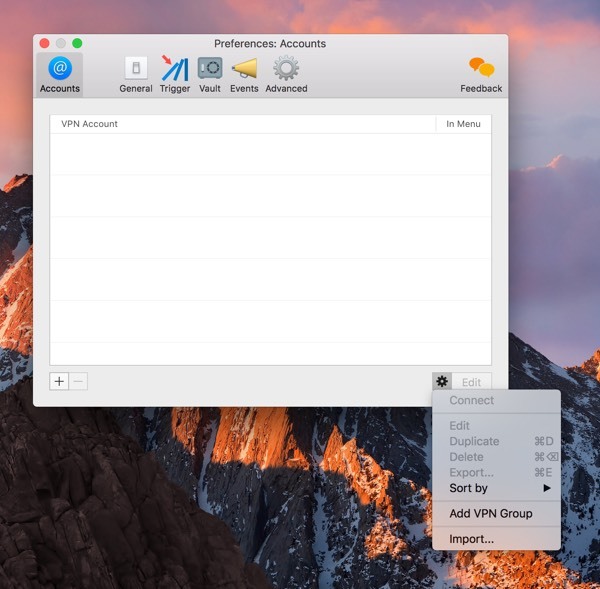 Normally, Shimo stores your VPN settings in its own directory in Application Support on your Mac. 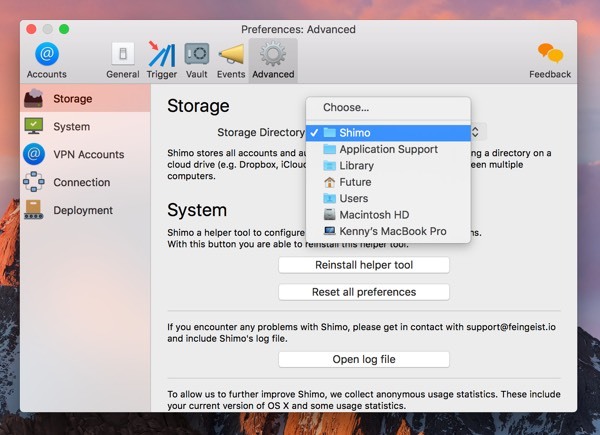 Open Shimo’s Preferences, click Advanced and then Storage. Click the menu next to Storage Directory and navigate to the shared folder. If you use Dropbox, iCloud Drive or similar, you can create a folder for the settings by selecting ‘Choose’, navigating to e.g. Dropbox and clicking New Folder. Tip: If you find that you’re having trouble with your internet connection, either when you’re connected using a VPN or directly, you should check your wifi network. Wifi Explorer and NetSpot, available in Setapp, will scan all the networks within range and detect and highlight problems. They also show spots where signals are weak and those where they are strong. Armed with that information, you can then optimize your network. Explore Setapp today and get all the apps you need to establish secure connections and private web browsing. And the collection keeps growing. Find out more.